Have you ever heard of jiggers? Here in the south, we have chiggers but don't be confused. Jiggers are not chiggers. Go figger. Jiggers are tiny parasitic sand fleas that will find a warm body in which to burrow. Jiggers are a huge problem in Uganda, Africa. It makes sense that if most of the population lives in homes with dirt floors and goes barefoot, jiggers have the perfect place to breed and wreak havoc. Once jiggers burrow in the skin (most often in the feet) of their unwilling host, they lay eggs. Eventually, this leads to painful sores and ulcers. If not treated, the jiggers can cause nerve damage, need for amputation and even death. Dru and Asher Collie began researching the problem of jiggers in Uganda a few years ago when Asher saw a video online about it. The Collies realized that the prevention and eventual cure for jiggers was simple: shoes. Simple for us, not quite as simple for the children of Uganda. So, they founded Sole Hope. 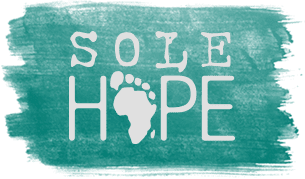 Sole Hope is an organization that aims to eliminate jiggers in Uganda through education and shoes. Eventually, they moved their precious family to Uganda to dedicate their lives full time to the cure and prevention of jiggers. They regularly hold clinics to wash feet, remove jiggers and provide shoes. They also provide an education to the precious people whom they serve to teach them how to avoid jigger infestation in the future. There are so many ways to help Sole Hope. One way is to hold a "shoe cutting party" with your friends, neighbors, church or other social organization. It's so simple and yet so very helpful. You order a kit from Sole Hope, complete with the patterns for shoes. Gather together a group of ANY size and trace that pattern onto old blue jeans, cut them out and mail them back to Sole Hope. Do you want to hear the next step in this beautiful process? They have hired locals from their village in Uganda and trained them as shoe makers. They pay them a fair wage and have taught them a very valuable trade that they may now use to support their family. Amazing, right? So, you mail the shoe patterns that you have cut back to Sole Hope and their shoe makers turn them into durable shoes to keep little feet from being jigger infested. Eventually, this problem of jiggers CAN be solved. We can help. Do you have a group that would like to get together and hold a shoe cutting party? It's so easy. It's so helpful. It's a tangible way to love your neighbor. Contact Sole Hope today! There are other ways you can help here. If you have questions about how this process worked for us, I will gladly answer to the best of my ability! *This post is not sponsored by anyone. Sole Hope has no clue who I am. I am just madly in love with what they are doing to serve and love the people of Uganda.